Take the Highway 22 exit (number 253). At the first light, head west (a left turn for those coming from the south, a right when coming from the north). Stay on Highway 22 for about 1.5 miles. As you pass 17th street you'll start up an overpass. At the top of this overpass there is an exit to the right. Take this exit (Willamette University is indicated on the sign). Keep left as the exit divides. After passing through the stoplight, you will see a Willamette University sign and entrance to the right. Pass by, and continue to the next stoplight, at Winter Street. Turn right on Winter Street, then pull into the Guest Parking lot immediately on the right. Take Highway 18 from Lincoln City (off Highway 101) east. Stay on Highway 18 for about 27 miles. Take the Salem exit (Highway 22). Stay on Highway 22 for about 26 miles. Highway 22 will take you into downtown Salem, crossing a bridge over the Willamette River, onto Center Street. Turn right on Winter Street (this is the northwest corner of campus). Just before the stoplight (Bellevue Street), turn left into the Guest Parking lot. After your pass over I-5, follow the I-5 directions above. 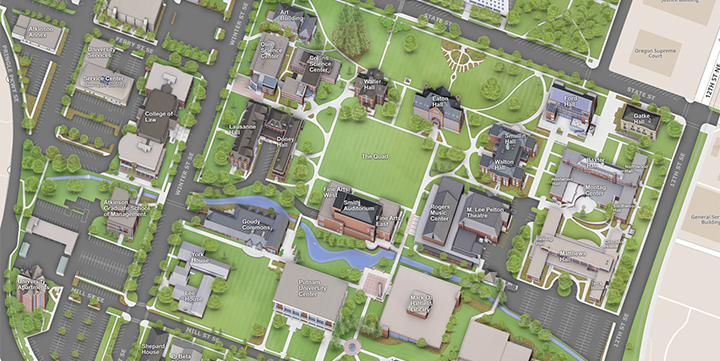 Take a look at the various maps to familiarize yourself with the Willamette University campus.